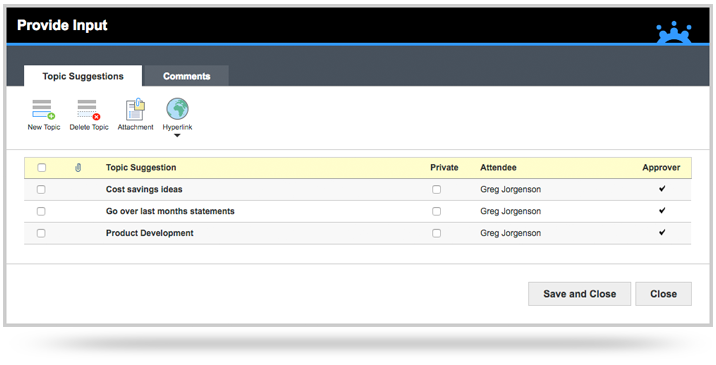 Create Professional Meeting Agendas with MeetingBooster! Every great meeting starts with an agenda, however creating a meeting agenda takes organization, communication and follow through. Luckily, MeetingBooster is here to make your life easier. Using MeetingBooster as your Meeting Agenda tool ensures that your agenda looks professional and contains the elements necessary to facilitate an effective meeting – every time. "MeetingBooster meeting agenda software allows me to quickly create a detailed meeting agenda and delivers the agenda to my attendees with 1 click – my meetings have never been better!" The topics contained in a meeting agenda can often be repetitive. Many meetings are created and executed using a prior meeting’s agenda with only a few modifications. 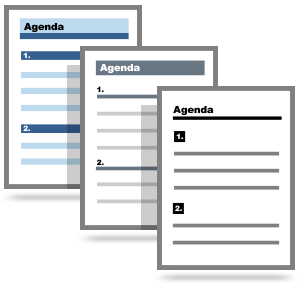 For organizations that are looking to standardize their meeting agendas, the creation of an agenda template can be extremely helpful. 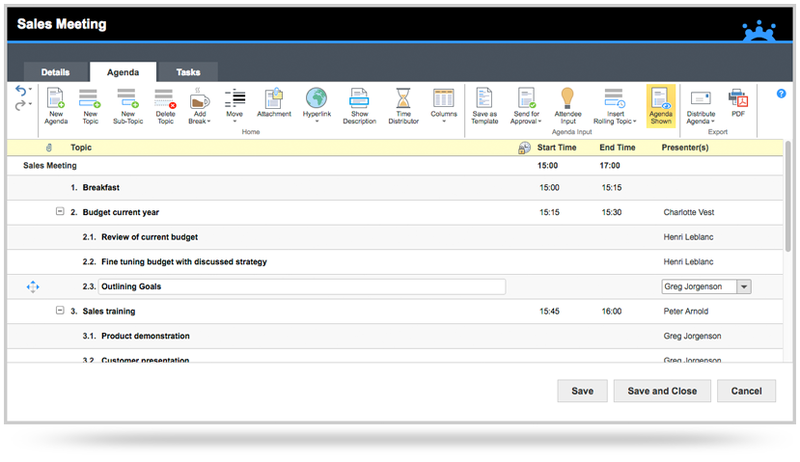 When creating a new meeting agenda, users can either browse through MeetingBooster's pre-made agenda templates, or create a custom meeting agenda template. Templates can be associated to a Meeting Series or Committee. Often times, meeting hosts struggle with the topics of the meeting agenda. MeetingBooster's Topic Suggestion feature allows a meeting host to request topic suggestions from attendees, easing the burden of developing the meeting agenda. Attendees can submit feedback on the agenda and the host can then approve or deny topics to be included in the final agenda. In some cases, the meeting agenda needs to be approved by a manager or colleague. MeetingBooster's Agenda Approval Process facilitates the approval process from start to finish. A meeting host can select specific MeetingBooster users to approve an agenda, send them an electronic request, and receive agenda approval and input, all with a few clicks. With MeetingBooster's Meeting Agenda Software tool, meeting organizers can create a professional agenda with a few mouse clicks. A simple MS Office style ribbon allows agenda creators to add topics, sub-topics, descriptions, presenters and more. You can make attendees co-organizers and allow them to help you create the agenda. You can easily attach files, link to SharePoint files, or make hyperlinks. Files are embedded in the finalized PDF version of the agenda to participants. If you need to allocate time slots for each topic, an intelligent time distribution feature helps you manage the topic times throughout your agenda – a huge time saver! MeetingBooster ensures that your meeting agenda provides the foundation for a successful meeting, guaranteed. Distributing the meeting agenda should not be a complicated process. With MeetingBooster's automated meeting agenda software distribution system, a host can quickly select all or specific attendees to receive the final meeting's agenda. Since the attendees email addresses are stored in the system, the meeting agenda distribution happens automatically, ensuring attendees receive the agenda prior to the meeting. You can even send the agenda to Guests that you have invited to the meeting. 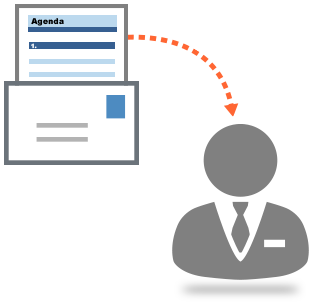 Attached files in your agenda are embedded in the agenda PDF that the participants receive. MeetingBooster even handles the formatting of the meeting agenda to ensure that it looks professional, contains the required information and is easy to follow. With customizable layouts and styles, MeetingBooster guarantees you will look like a pro at your next meeting.